Mini-minivan sold in Europe as the Carens and the US as the Rondo gets replaced with all-new third-generation model. Kia&apos;s been on a bit of a product offensive lately, unveiling the new Forte just a couple of months ago and following it up with a full new range of Cee&apos;d models. In between those new debuts, the Korean automaker released teaser renderings of a new Carens minivan, and has now followed up with the first photos of the production model. The third-generation MPV to carry the Carens nameplate, the all-new model will debut at the Paris Motor Show in mere days from now. The new Carens is a ground-up redesign of Kia&apos;s compact people-carrier, available with up to seven seats. The 2nd-gen model it replaces is sold in the US as the Rondo, so expect the new Carens will do the same. 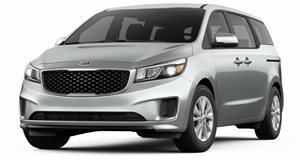 It&apos;s based on a new platform and adopts a more dynamic design, complete with Kia&apos;s new family grille. Technical details have yet to be revealed, but the outgoing model is available with engines ranging from a 2.0-liter four to a 2.7-liter V6, with transmissions ranging from four speeds to six. Expect the new Carens to feature more advanced powertrain options, with smaller but more powerful and economical engines and transmissions with more speeds.